This weekend was a very busy weekend! It started out around 6:30 Saturday morning - when I got up to get ready to help out with a local 5k - after that we were off to Tucker's soccer game - then to my sister's house for my nephew's birthday party - to Freeport for a little belated birthday shopping for Ward - then to my dad's house for dinner - then home around 6:30 pm. It was already dark - and I HATE running in the dark - so I settled for 1 mile just to keep the October Run Streak alive. I brought Pepper along for protection, and my cell phone. But let's back up to Saturday morning's 5k. This was the first time I really involved in organizing a 5k. I had helped before by measuring out a course, but that was it. This time I went to organizational meetings and actually had input. My job was to map out the course. AWESOME!!!! I was so excited! Then I had Ward make mile marker signs - which I put out, along with course directional signs that morning. so we'll have them for further 5ks! After making two loops of the course to make sure the signage was just right - maybe a little OCD...but it has always driven me crazy to have a poorly marked 5k. Even on straightaways - when you start to think "was I supposed to turn somewhere?" I'd rather have too many signs than not enough. When I came back to the registration table, I collected shoe donations (well, 2 pairs but it's still great!) for Kindrunner Kindcash, helped explain directions, did the countdown "3,2,1 - GO!" and the runners were off! Then I found my little spot by the finish line so I could also be the Maine Running Photos Photographer. Then the first runner came in with an astounding time of 15:40ish. Crazy! I started to think maybe my course was a bit too short. Ooops! Then a couple of minutes later, Ward came cruising in with Izzy in the jogger. Then Wade came in with my niece Scout. Then a little later, my dad came in, smiling. Awesome! I am proud of Ward for taking 1st in his age and my dad even placed 1st in his age group! Awesome. However, both of them had left before the award ceremony, so I got to take their ribbons. Luckily I was going to see my dad in a little bit, so I was able to take this pic of my proud dad! Then this morning, I met Carrie for her last long run, and my longest run since the injuries. We met in her town and she was in charge of the course. It was a challenging, hilly course - which I think was definitely harder than the final leg of the MDI marathon. But it was always a pretty course. I love Bath, and I love the older houses. And the company was awfully nice as well. We were even quite stylish and just about twinsies! She was wearing her Spandits Skull capris and I was wearing my Aurora Borealis capris and we both wore our Garmin 10's. Apparently she ran further than I did because her Garmin read 10.10 and mine read 10.09. I'm going with hers. Always go with the longer distance. I feel better about MDI now and I think she is definitely ready for her marathon. I'm only running the last leg with her - as part of a relay (while Jill and Stacy take the first two legs with her). I cannot wait! I was very sad Jill and Stacy couldn't make it. But we'll be together shortly! This post makes me smile!! Love it and kuddos to your dad. That's just so cool. Congratulations to all of you! Glad you see you in the double digits. You have been so smart and patient. Your dad is so awesome!! Awww, shucks. I am so glad we got to run together! That was my best 10-miler by far! 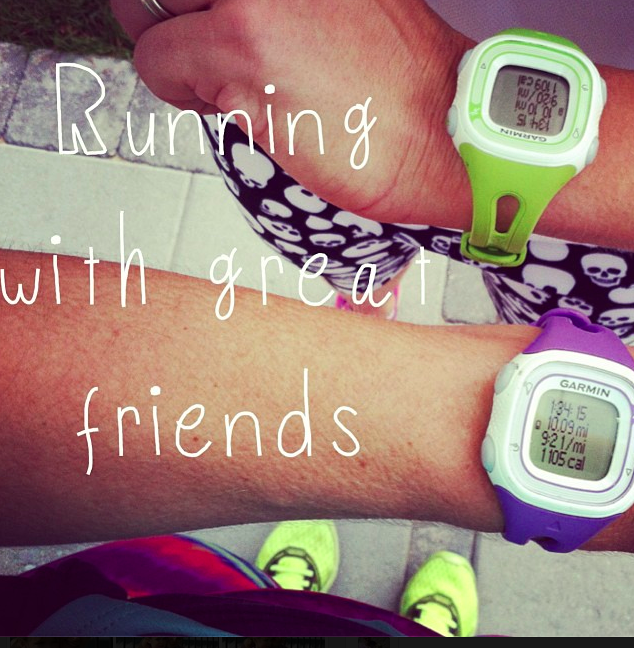 Lots of running this weekend for you!! 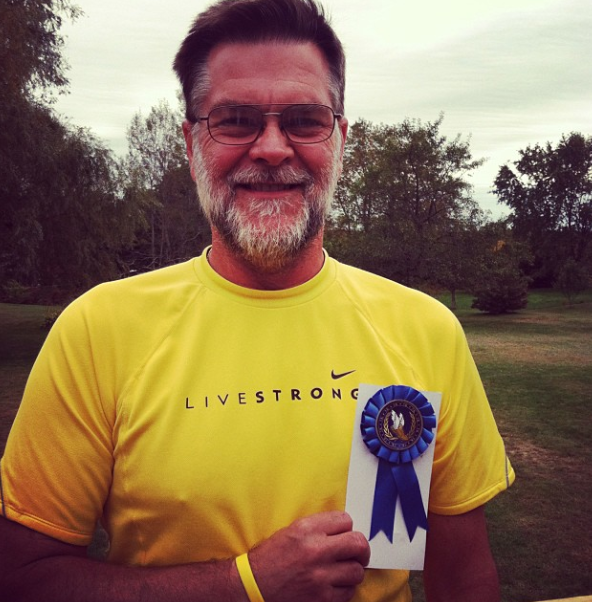 Congratulations to your dad for winning his age group, he looks so happy! Glad the race went so well. Always nice to have too many signs instead of not enough!